ARMAGEDDON looms in the Chess World Championship after the most dramatic title showdown in recent memory crashed to another grinding halt in the final scheduled match. 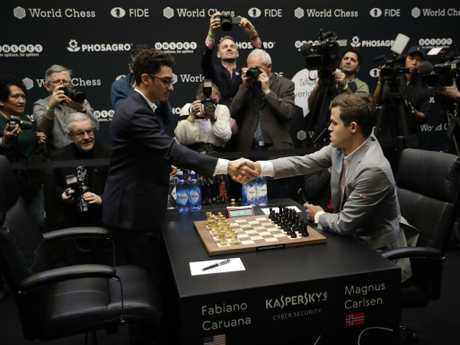 The World Chess Federation Championship between American challenger Fabiano Caruana and Norway's champion Magnus Carlsen has already become the first title showdown between grand masters that's failed to record a deadlock-busting victory across the 12 classic games scheduled. 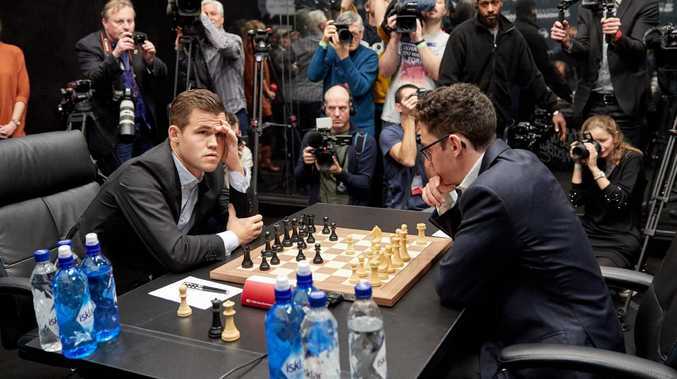 Every previous world championship showdown since 1886 - 132 years ago - has witnessed some kind of breakthrough, but Caruana and Carlsen remain deadlocked after more than 50 hours of play over nearly three weeks inside London's The College of Holborn theatre. That doesn't begin to tell the story of pure drama. The showdown was first plunged into scandal when a three-minute video leaked online showed secrets of Fabiano's championship training camp in St Louis. Reigning champion Carlsen then showed up for Game 9 sporting a black eye which he'd suffered during a weekend amateur football game. He needed to be cleared for concussion by his own medical team before the championship was allowed to continue. The reigning champ is starting to crack. The very next game Carlsen inexplicably dropped his bundle when he had been on the verge of a famous victory. His one mistake allowed Caruana to sneak through for another draw. The 27-year-old admitted he "blew it". 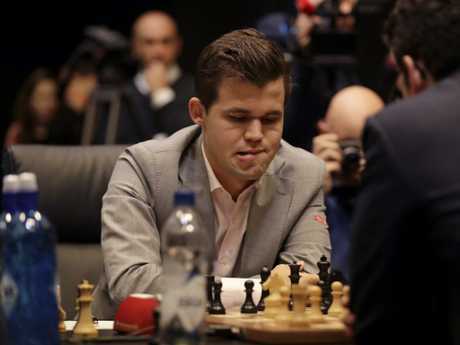 Grand masters around the globe declared Carlsen may have been suffering the affects of concussion. In Game 12, Carlsen seized control of the game after Caruana switched to the so-called Petrov Defence and was picked apart by his Norwegian rival. Again, the chess world was shocked as Carlsen proposed a draw with Caruana after 21 moves. Victory had been within his grasp. "I'm very shocked by Magnus's decision," Hikaru Nakamura, an American grand master, told chess.com at the time. All the delicious drama from the 12-drawn regulation games is simply the appetiser to the main event of mayhem predicted for when the championship heads into sudden death on Thursday morning (AEDT). The match - which is taking place behind soundproof glass on a stage in London - now comes down to a series of rapid games. Opinion across chess commentators is divided ahead of the sudden death showdown - but many already predict the world championship will be decided by an "Armageddon" tiebreaker. The two players will first face off in four games with rapid time controls - 25 minutes plus 10 additional seconds per move for each player. If the match remains deadlocked after that, they will play a series of five-minute games. And if that fails to produce a winner, the match will end in an "Armageddon" game - where the player with the white pieces gets five minutes on the clock while the person playing black only gets four minutes, but a draw counts as a win for black. An Armageddon match has never been used to decide the world championship in 132 years of recorded history. That is now likely to change. Carlsen has drawn the white pieces for the sudden death round. While Carlsen, defending his crown for the third time, is considered the higher ranked speed-round player, there are now question marks surrounding his mental state after his inexplicable peace offering in the 12th classic game. "In light of this shocking draw offer from Magnus in a superior position with more time, I reconsider my evaluation of him being the favourite in rapids," former world champion Garry Kasparov tweeted. Even Caruana acknowledged he was "relieved" to be able to reach the tiebreakers after being on the ropes in the last game. "When you feel like you're sort of on the brink of defeat, or at least you have a very dangerous position, then of course it's quite good," the American said. Carlsen, though, remained confident in his ability to outplay the challenger in speed chess. 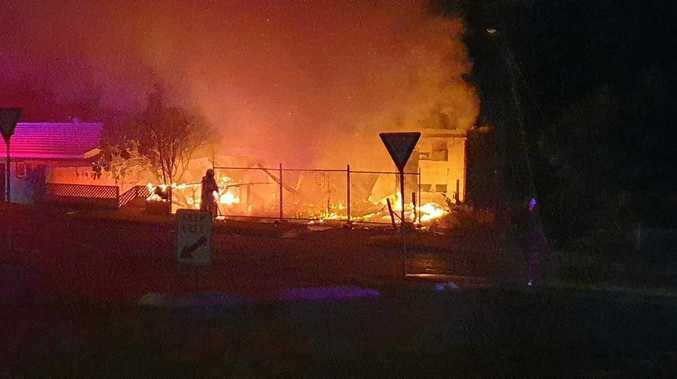 "I think I have very good chances obviously," the Norwegian said. "But I don't know what's going to happen." Nobody does, and that's why this showdown is the best thing in sport right now. The winner will get 550,000 euros ($860,000), with the runner-up pocketing 450,000 euros ($700,000).